I recently finished the second of my 12 items for the Spin the Bin Challenge. 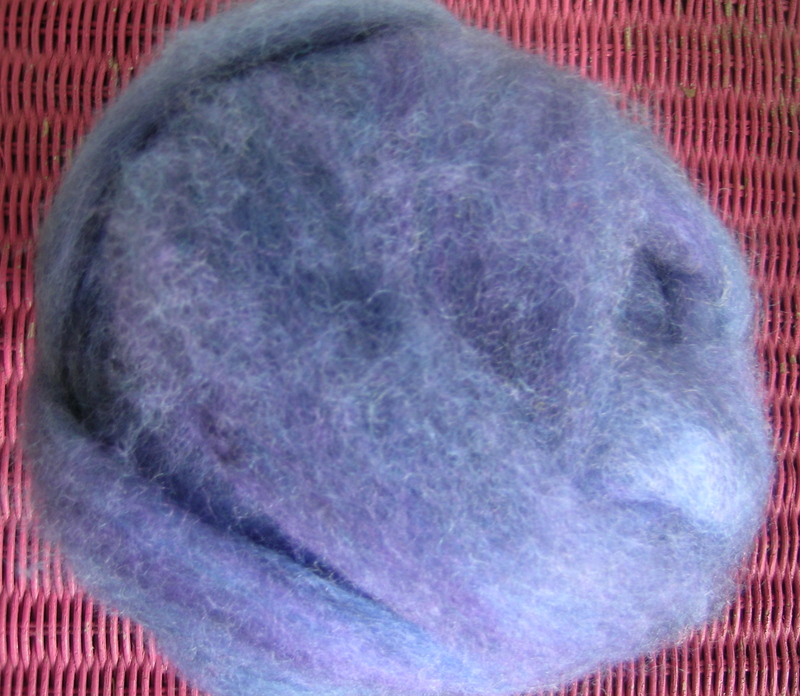 This was a fiber from River’s Edge Fiber Arts, called Monkey. 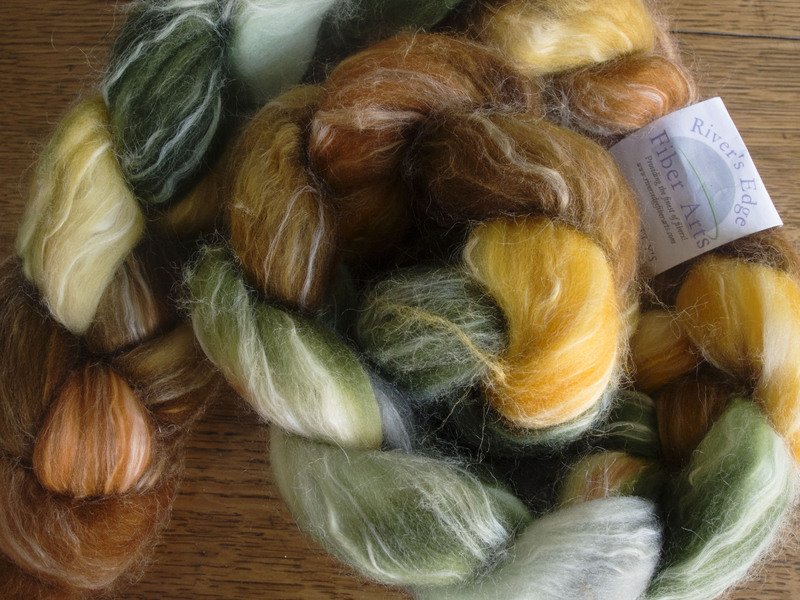 Silk, bamboo and Merino. 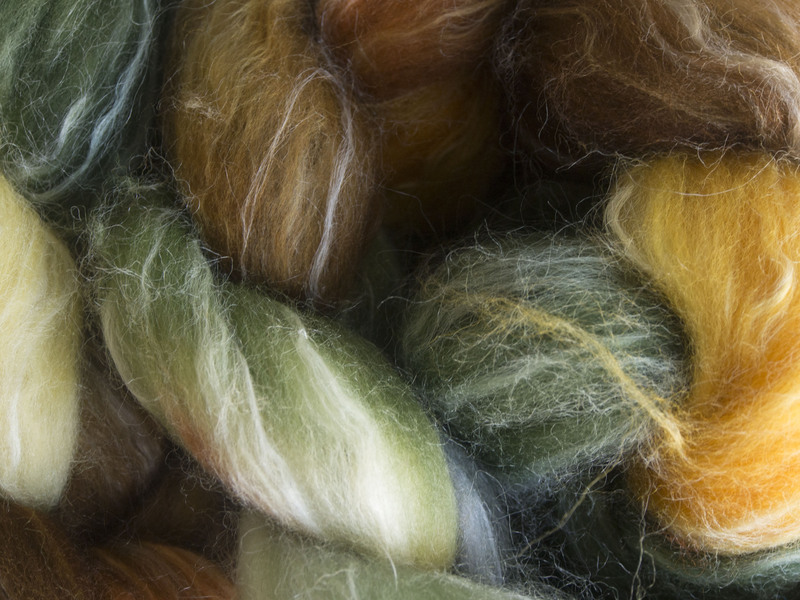 It was a dream to spin, but the fiber was so silky that it was not a fine spin. Thinking that this would feel so good on my hands, I chose to make a 3ply yarn for some future mittens. Yardage was not as good as I would have liked, 160 yards of 3 ply, 4 oz. 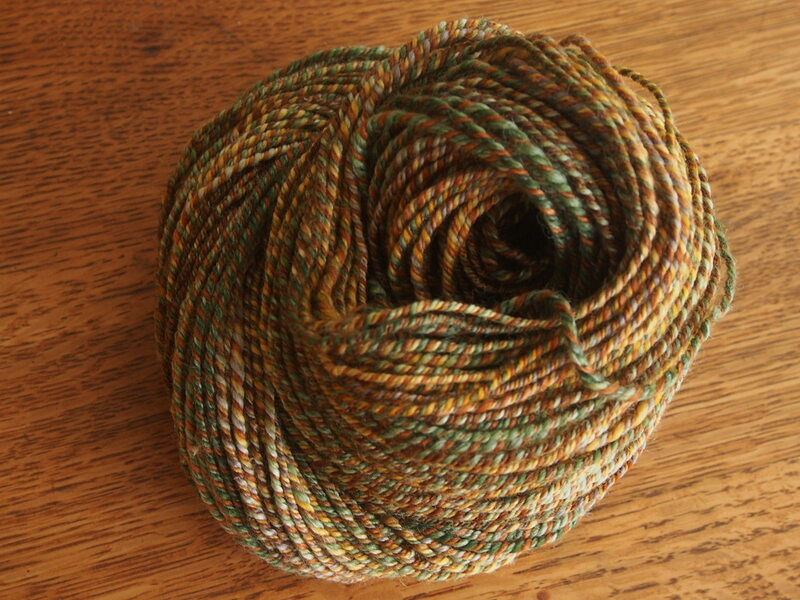 Your handspun is just gorgeous! These socks were started in January and took over 2 months to finish. The yarn color was very dark, and they were difficult to knit up at SnB or on a dreary day because of this. While cashmere in socks is wonderful on your feet, I do find it to be more splity than other sock yarns. These were from the Cookie A sock club, and this was the December 2012 pattern, it was the simpler of the 2 patterns available. Between the difficulty of knitting with this yarn, and the dark color I had to abandon the harder pattern for my sanity. They were gifted to my Mom when I was up a couple of weeks ago visiting her. She loved them. These are awesome! I love the lace pattern. 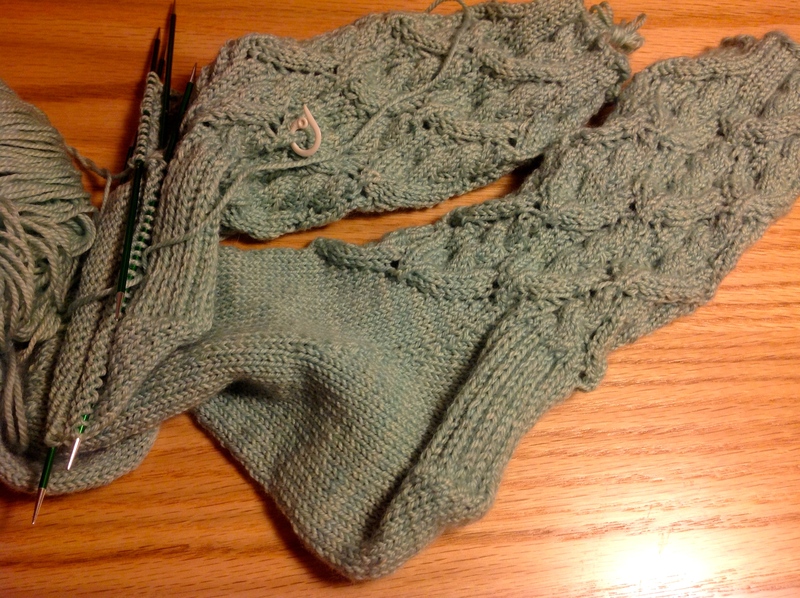 Second Sock Syndrome is a complaint of many sock knitters. They seem to be anxious to try out a new pattern, and knit the first sock up, only to have the second appear less interesting to knit, and it languishes. 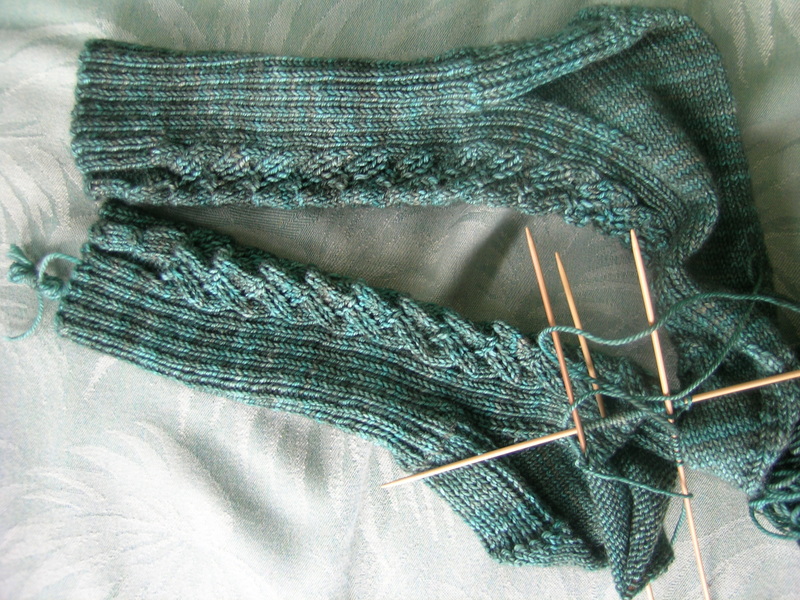 That was never a problem for me, as I was either anxious to finish a quick knit, or had conquered the complexities of a more difficult pattern and the second sock seemed easy by comparison. Lately I have a new problem however, I seem to be starting and not finishing any first socks. There is a good reason for all, but bothersome none-the-less. 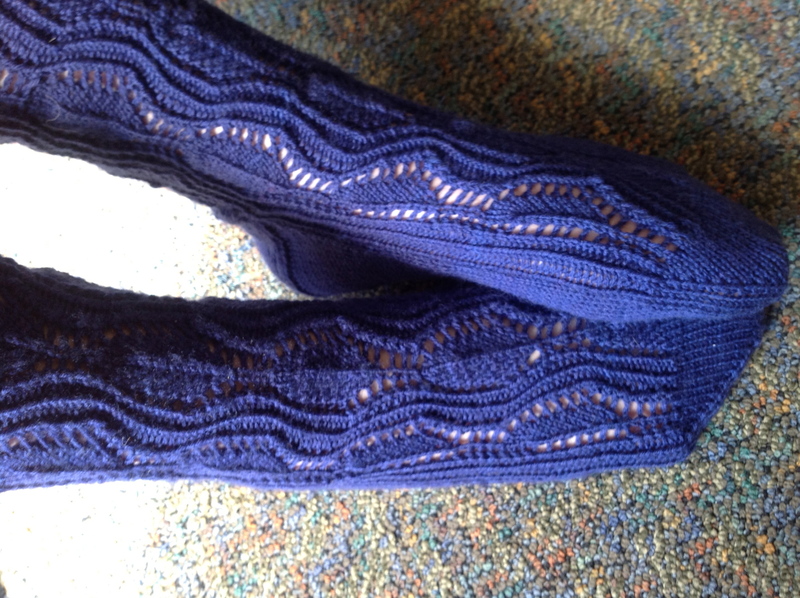 The beautiful blue socks are from the Knitteratus Scok Club by Janel Laidman, I love the pattern, the twisted rib on the bottom of the foot is so squishy and comfortable. Almost done with sock #1 of theses. The green pair is from the same club, a February installment. I could not travel with these socks and follow the pattern, so they remained at home and got abandoned when I needed the needles for a pair of traveling knitting socks (ie, a less complicated pattern), and they sit dangerously off needles, and without any stitch holders to hold them in place. The lime green pair is from the CookieA sock club, and while the pattern is interesting and different from anything I had tried, it broke one of my precious Lantern Moon needles, and I switched to metal. I am now waiting on some Signature needles to finish these up. I have never had this many started socks before. 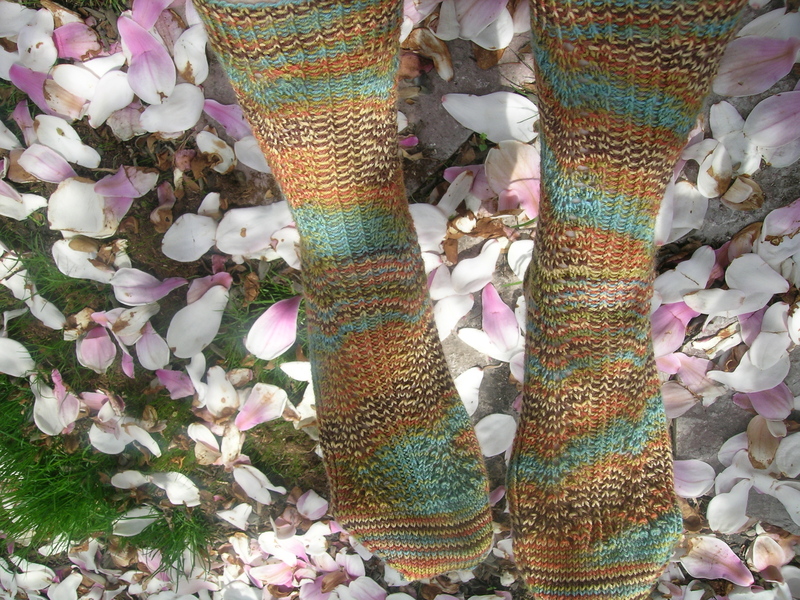 And lastly, there is the pair of CookieA socks, using some handspun yarn. These will be for my husband, but I could not finish them while away, as I needed to get reinforcing thread for the toes. Hope to finish these up soon. Amazing that you have any time to do quilting! Still working on my second PB&J sock from the CookieA sock club. 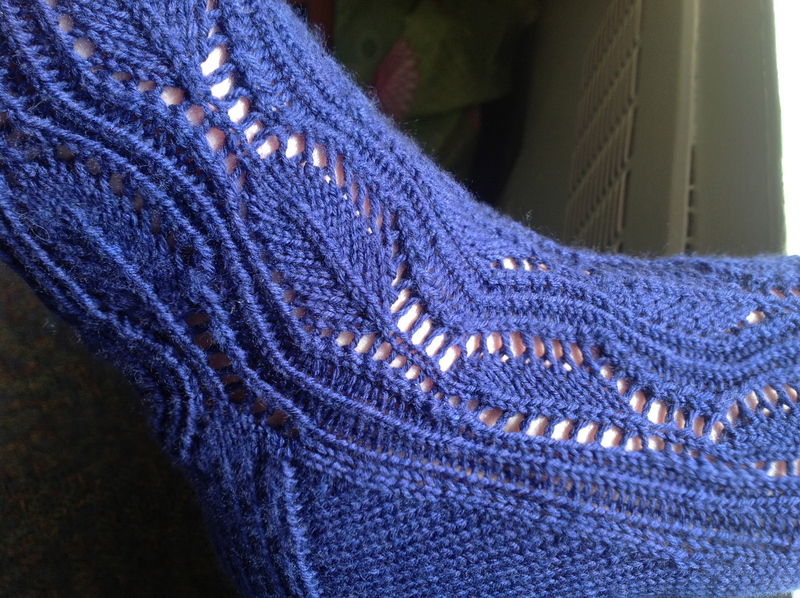 The pattern has 2 different columns of twisted rib stitches that travel down the leg and cross over each other. One side, the Jelly side I assume, with squiggles, looks the same on both socks. 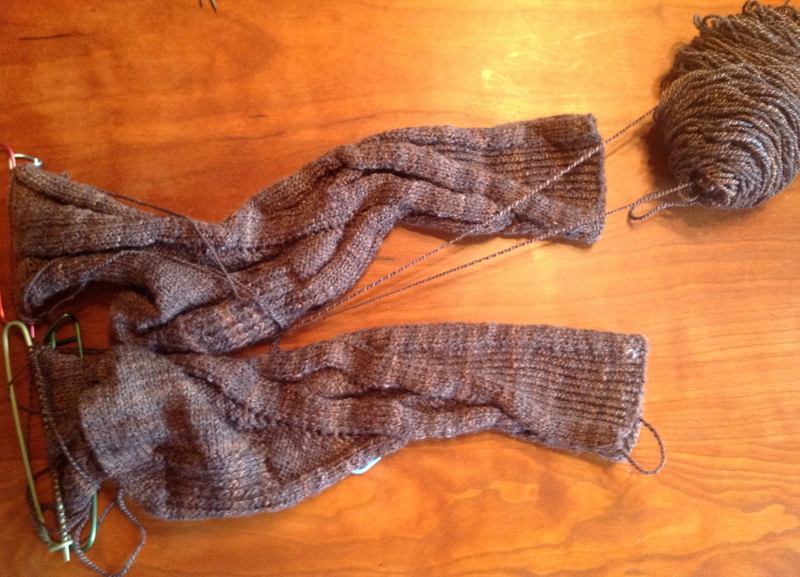 The angled traveling stitch pattern, the peanut butter, looks very different form one sock to the other. I started with the left sock first (got all my papers mixed up). And am now on the right sock, which most people started with first. I understand the desire to mirror image these socks, but it just does not work with the angled pattern. There is a very different effect with the twisted stitch traveling to the right versus the left. 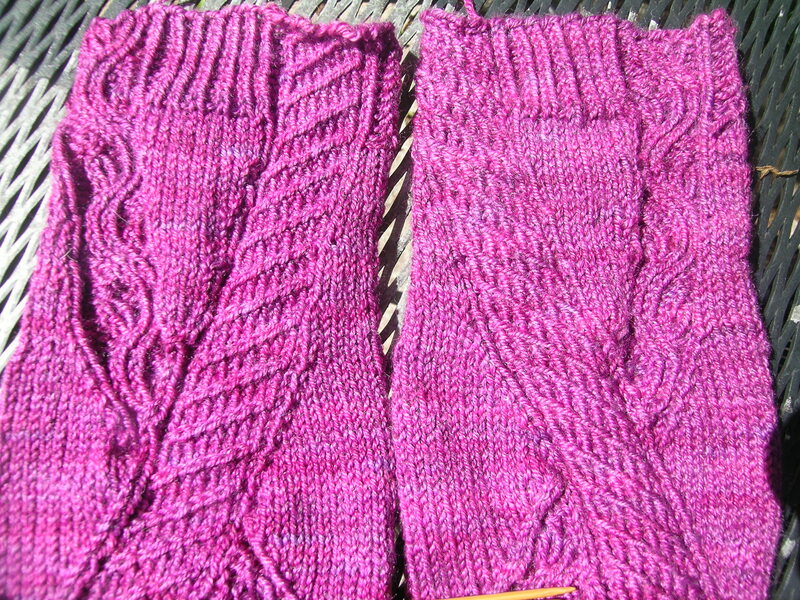 The sock on the right was my first sock (the left foot according to the pattern), and I am working on the opposite foot (left in the photo below). The curvy pattern looks fine from both, but the angled pattern is very different. I showed it to my knitting group last night, and the comment was that they do not even look like the same stitch. I prefer the left hand photo, others liked the right. Hard to tell from the photos in the pattern if the test knitter had the same issues. Clearly much more stitch definition in the sock on the left. 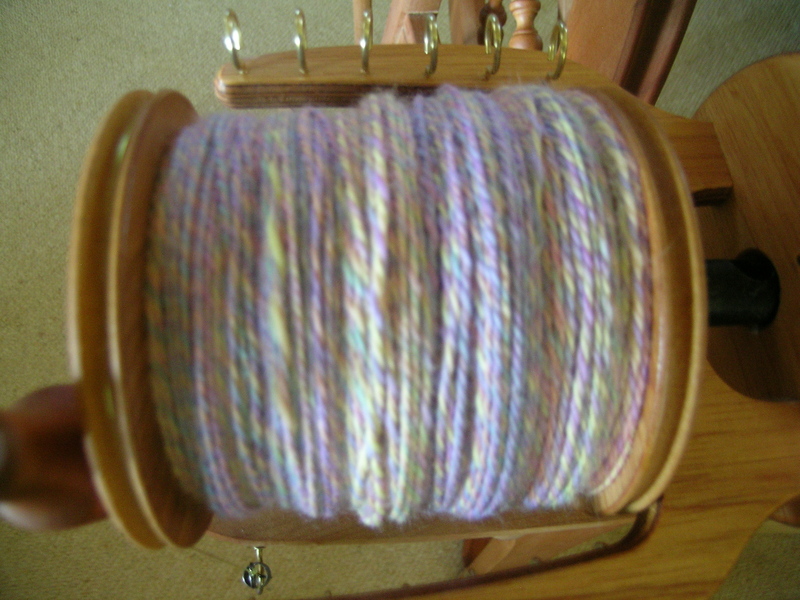 On the spinning front, I finished plying and washing my 3ply Louet yarn. I am not real pleased with the pastel colors, they got very washed out and muted. I got 400 yards of a 3 ply out of 8 oz. of pencil roving. Maybe if you did the left sock with a Z-twist and the right sock with a S-twist, you could get matching socks? Of course I am kidding, but I wouldn’t put it past one of us nutjobs. (says the nutjob who thought of it). It’s a beautiful sock. 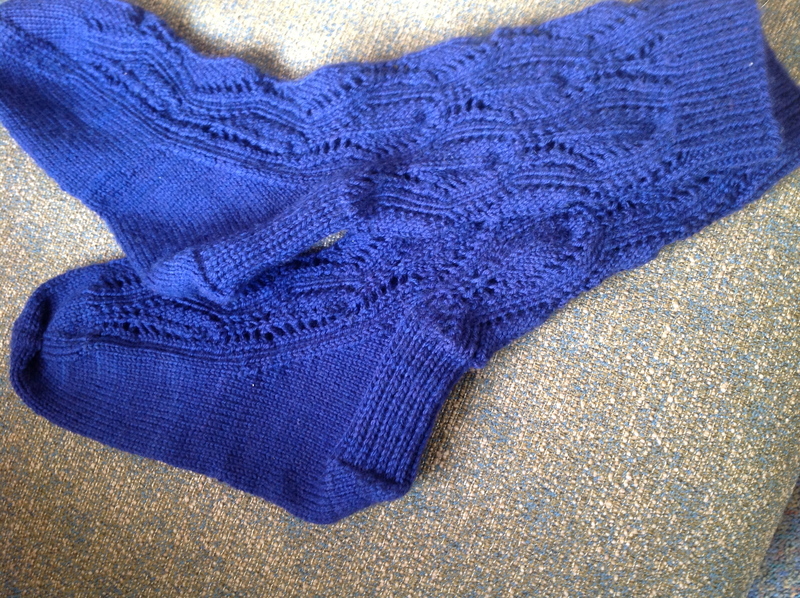 I finished the Yo socks from the April CookieA club patterns a couple of weeks ago. 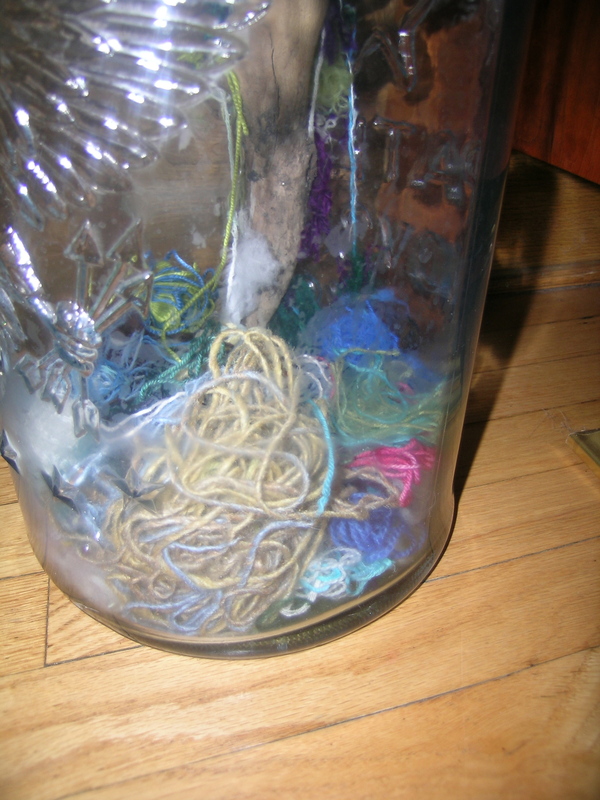 And my jar of scraps for TULSA. Not filling up quite as quickly as I thought it would, although I have been doing more spinning of late than knitting. 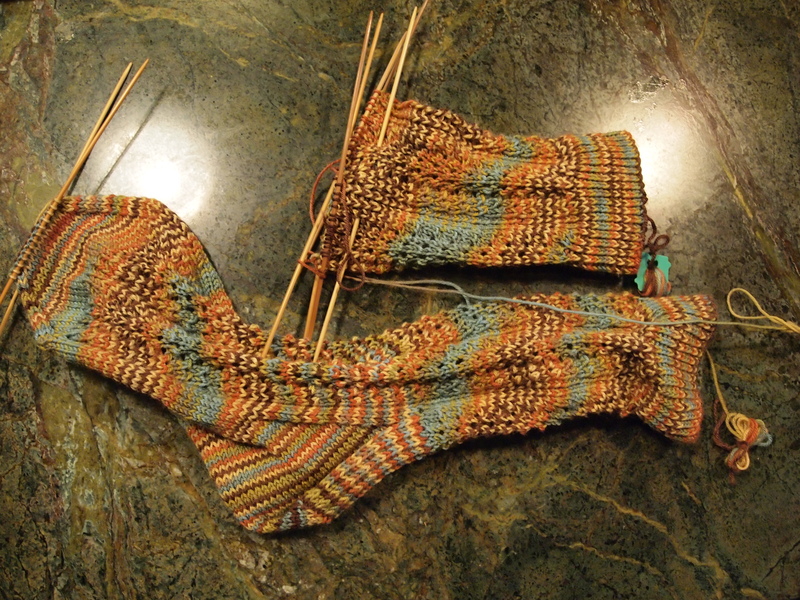 I am making the first of 2 pairs of socks from the April CookieA sock club. Using my own stash yarn for these, it is a Lorna’s Laces sock yarn. Knitting it up, the colors remind me of the southwest. The lace pattern is very easy to remember, 4 repeats in a row, then 3 rows of stockinette stitch. I started with the large size, and it seemed too big (I wasn’t reading the pattern first, where you decrease after the top ribbing), so I went down to the medium. With the stretch of the lace, this fits just fine. Not sure if these are for me or to give away. I still am surprised sometimes by how yarn knits up. I usually prefer not to have striping, but pooling instead. This has a combination of the two. 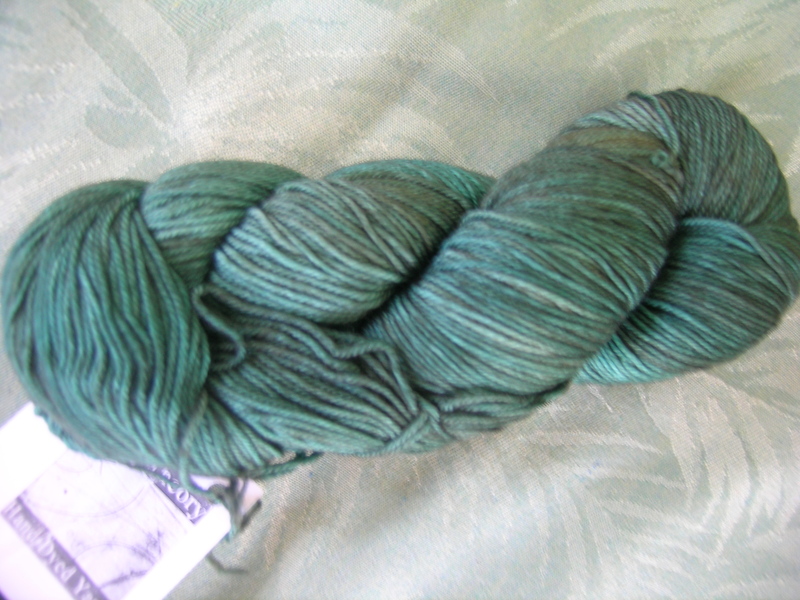 I received this yarn from my first installment of the CookieA sock club. 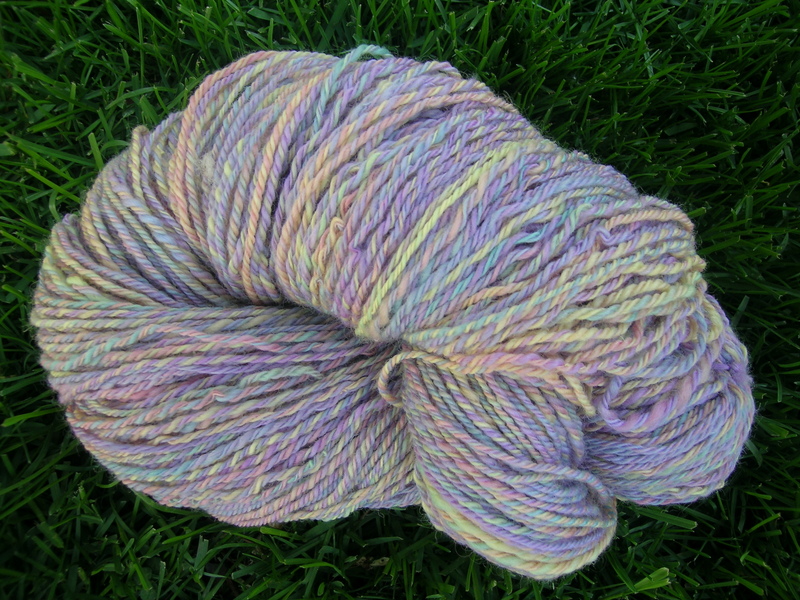 It is String Theory sock yarn. I wasn’t wowed by the colors, but set about knitting up the pattern included. The yarn is incredibly soft, and I love the subtle color changes. 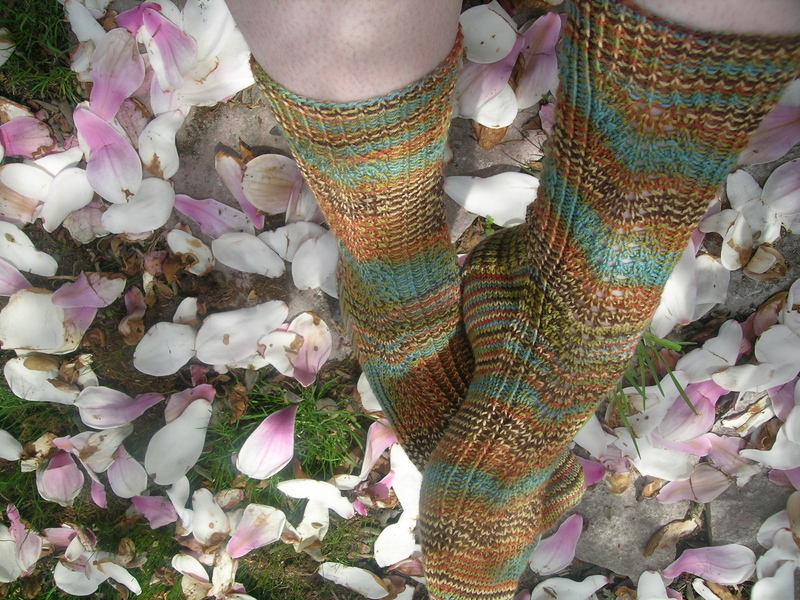 This is a mix of greens and browns (although some of the photos of others from the sock club have a more blue-green hue to them). 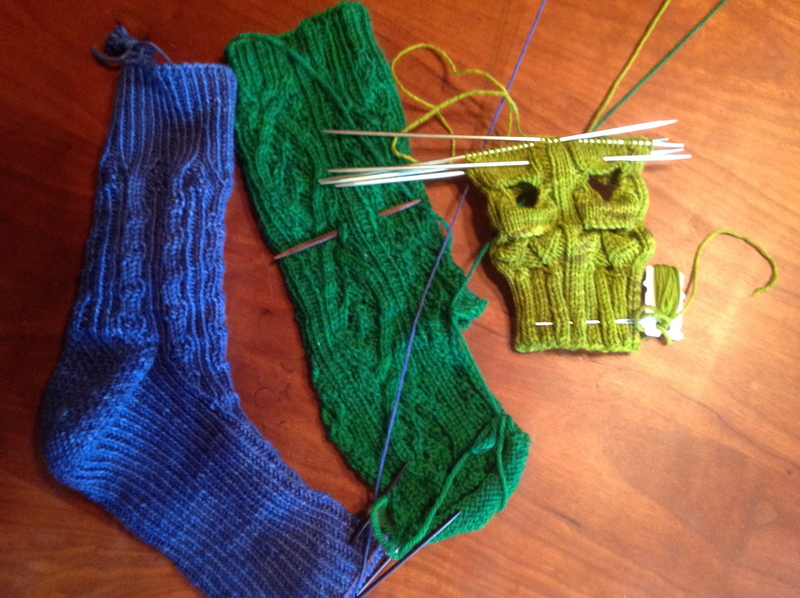 While I was working on the first sock, before I had determined the calf length, my husband commented to me on what beautiful colors those were. Now mind you, he is extremely supportive of my fiber addiction, goes to yarn shops and festivals with me, and encourages me in all my knitting and spinning pursuits, but he usually gives no comment about colors or yarns. So, problem of my not loving the color solved! I asked him if he would wear the socks with the cable panel down the front, and he enthusiastically answered yes. So, I extended the calf length a bit and made the Haleakala without the traveling rib. The yarn is knitting up incredibly soft, most likely due to the cashmere content. 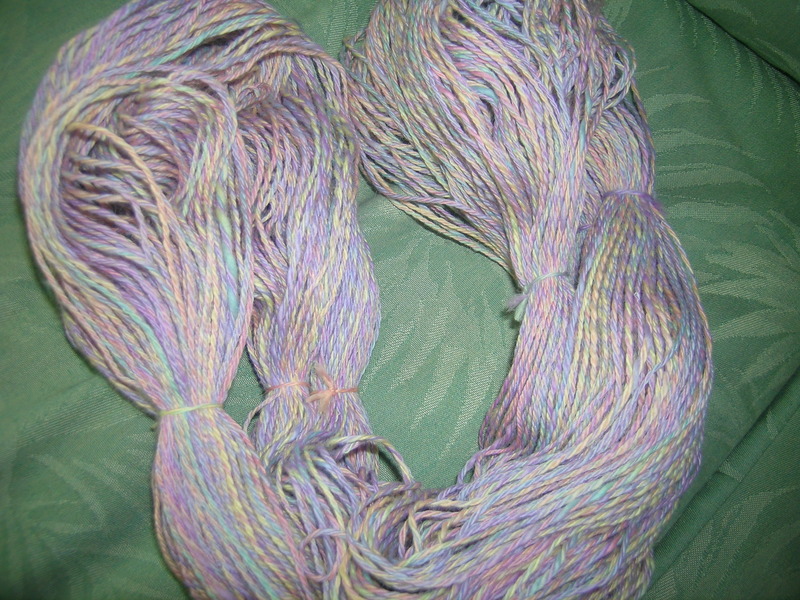 There are occasional small slubs on the yarn, but they are easily pulled off. 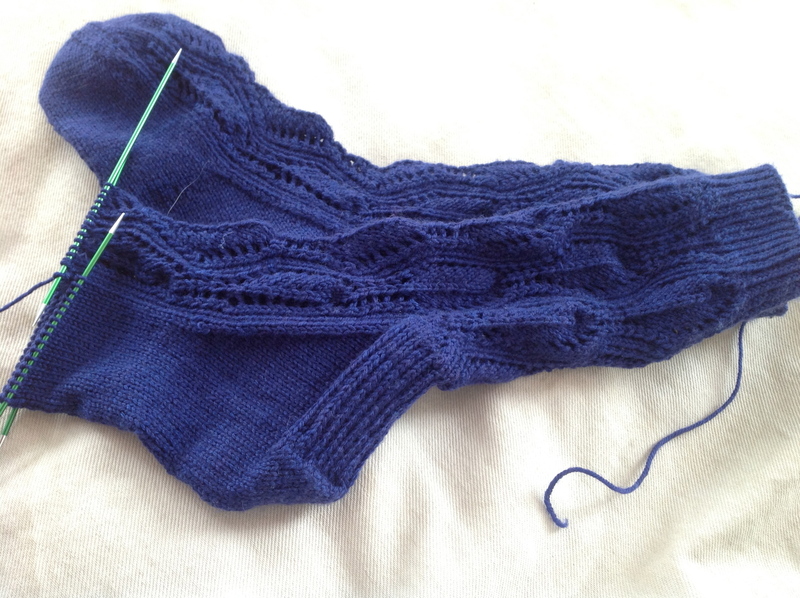 I am almost finished with the second sock on which I reversed the center cable here to the back, not noticeable by most. I am waiting for the next club shipment to arrive (I have already peaked at the spoilers, and am very excited about those socks), and should have these complete in time. Perhaps tomorrow. Manning surprised me at SnB on Monday with this beautiful roving, aptly called “Lady of the Lake” that she got while at a sheep farm in Wisconsin. I can’t remember the sheep breed, help Manning? 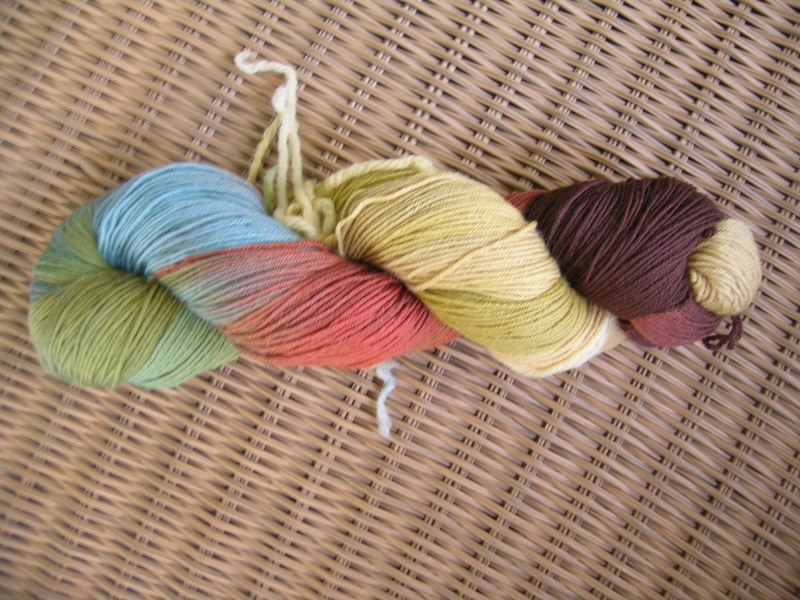 Love the colors, and I will get back to spinning shortly.